In other news, Gus Stirrat Band will be playing our first gig in… well, let’s just say a long time. Gus is so prodigiously busy playing bass (including Fat Suit and Animal Society) and running his own studio that he barely has time for his own stuff. But when it happens, the energy is off the scale! We play at the Blue Arrow tomorrow, Thursday the 7th of March. Also had a lovely time doing Mike Maran’s show about R D Laing - look at this sky before the gig in Tullynessle! You’l have to write the punchline yourself, but I’m about to head up north to Aberdeenshire with Mike Maran to do a show about R D Laing. I had a wonderful time doing his show about Chet Baker in France last summer, and this one is also great fun - quite a bit darker musically speaking, but with some sublime choices by the original pianist for the show, Dave Milligan. Looking forward to putting my own spin on it with Mike soon! We are in Crathes on Feb 22nd and Tullynessle on the 23rd. Just finished recording album 4 with Fat Suit, what a blast! We had some special guests on this record and I think it’s going to be quite something…. Just finished a last couple of things before Christmas - firstly, we recorded an EP with Joe Williamson’s new band, Animal Society. Joe is the current Scottish Young Jazz Musician of the Year, but this music is pretty heavy and ferocious, perhaps more in line with prog rock (although there is certainly a strong jazz sensibility running through it). It is also just great fun! We’ll have some video up late winter/early spring 2019. After that, we had a short run of Fat Suit dates to close out the year - and I played violin for the first time in 13 years… on stage… in front of an audience… we’ll see if that changes Santa’s judgement on whether I have been naughty or nice this year! I'm sure I've written about how much I love the Autumn before, but as September draws near I can't help repeating myself. Thinking of Scottish jazz fixtures in early Autumn, it has to be Islay Jazz Festival! I will be there playing some solo piano and with Colin Steele Quintet. I went to see the quintet often when I was getting started, and so it will possibly be a little surreal playing that music myself, but I'm very much looking forward to it. Nice to finally get my hands on this! Well, that was a blast - 7 very enjoyable gigs at Edinburgh Jazz Festival, trio reunited in Wigan, Fat-Suit playing at a country music festival (I saw Steve Earle! ), various bits and bobs, woah! Time for a wee holiday to the beautiful Isle of Arran. I've been over a good few times for gigs, but never just to relax and see the island, so really looking forward to that. Before that, I will be heading down to the World Shakuhachi Festival in London to play with Zac Zinger. Zac is a friend and colleague from Berklee days, a multi-instrumentalist and composer/arranger/general badass - and yes, he will be playing jazz shakuhachi (it's a Japanese bamboo flute, and one of the go-to instruments for a "sound of Japan"). After I get back, I'll be playing at the notorious Boomtown festival with Fat-Suit and then at Dunoon Jazz Festival with Luca Manning - two VERY different gigs right there! I'll then be playing with Scottish Young Jazz Musician of the Year, Joe Williamson, for a live broadcast of BBC3's Jazz Now from their Edinburgh International Festival tent. Should be a nice way to round off a brilliant summer! Oh, and I went over to play some tunes with Andrew the other day and he gave me a wee present... Guess it will live with me for a while and who knows, maybe with Marton after that? Over the moon to announce that Little Mysteries won Best Album in the 2018 Scottish Jazz Awards!! Thanks so much to everyone that voted for us, we are so thrilled that people liked the music enough to support us. Now looking forward to a rare Alan Benzie Quartet gig at the Jazz Bar on the 13th of June, then the Glasgow Jazz Festival - the Mezcla gig at Stereo on the 21st is going to be monstrous - we'll be playing some new music and doing a cool collaboration with visual artist Jamie Johnson. 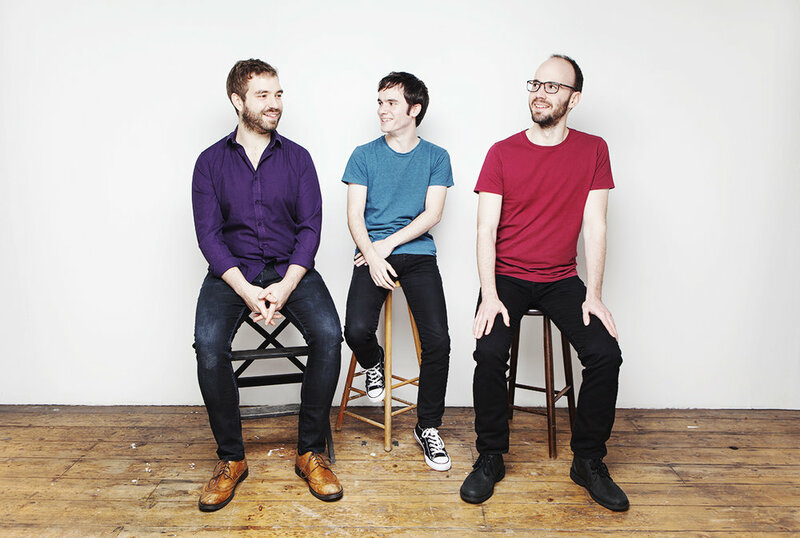 I'm also in a new put together by Scottish Young Jazz Musician of the Year Joe Williamson (also known for Square One and Spark Trio and pictured at Jazzahead, below). He's written some heavy stuff, which we'll be premiering at Bar Bloc later in the month. Also playing some groovy jazz/funk with Malcolm MacFarlane and a tribute to Chet Baker with Luca Manning - check out the gigs page for more details of all that. Woohoo!! Well, it's been a good couple of months. Been having a great time playing quite a few gigs with Mezcla, particularly Jazz in the Round in London - that is a cool gig! 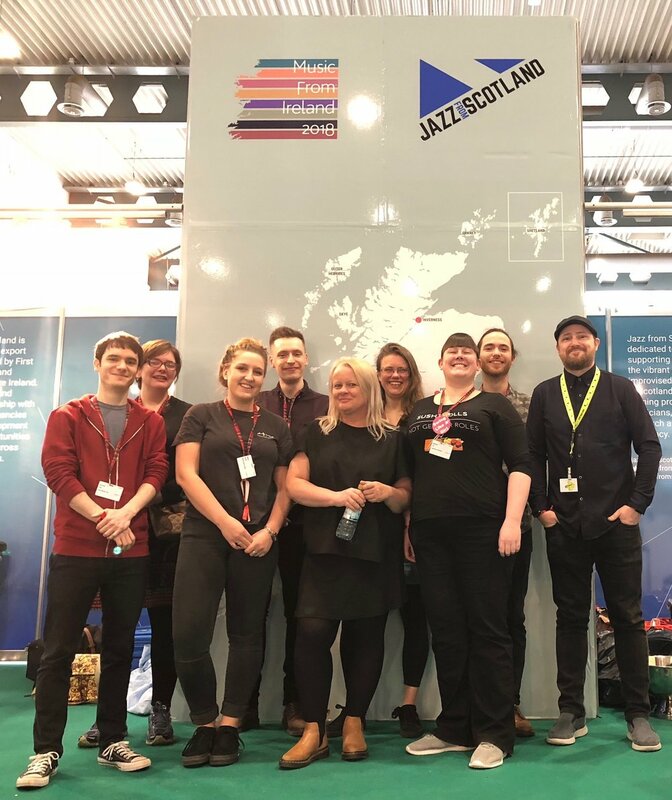 I was also delighted to be one of the artists selected by Jazz From Scotland for support to attend Jazzahead, a massive jazz conference/expo/festival that happens in Bremen every April. It was a very intense experience, but also very interesting and useful and I hope to go again in the years to come. Thanks so much to Jazz From Scotland and Creative Scotland, as well as Music from Ireland, Improvised Music Company, Culture Ireland and the Irish Arts Council for making it all happen. May highlights include BBC Biggest Weekend with Mezcla in Perth on the 25th and trumpet beast Ryan Quigley's Quintet at Ronnie Scott's on the 29th. As ever, you can find details of these and others on the gigs page. Voting is also still open for the 2018 Scottish Jazz Awards! Head over to http://www.jazzfest.co.uk/awards/ and check it out if you haven't already. I had an amazing time with Andrew and Marton on our release tour for "Little Mysteries" - 9 countries, 14 cities, 16 concerts and countless good memories! Sadly, all good things must come to an end, but we will be back and looking forward to seeing some familiar and friendly faces next time. Thanks so much to everyone who came out to hear us in all these different places and made it so special for us - if you want to stay up to date then you can join my mailing list using the subscribe buttons on this site or like my Facebook page. Little Mysteries is now fully available, and you can purchase digital copies on CD Baby (or iTunes etc, but CD Baby is a better deal for musicians...). For physical copies you can get in touch with me. I'm now looking forward to playing with Fat-Suit and very talented young saxophonist Matt Carmichael at the Aberdeen Jazz Festival on the 17th and 18th of March. As ever, you can find more details on exactly where and when on the gigs page. Hopefully see some of you there! I'll be updating the gigs page with more specifics on each gig as we get the final details, so check back there for more info! The first video from the studio session for "Little Mysteries" is live - check it out! Just a couple of gigs left before Christmas, the highlights are a really fun double bill with Mezcla and Oxtered to the Bothy in Glasgow on the 11th, and Leah Gough-Cooper's Human Equivalent in Edinburgh on the 23rd. More details on the gigs page. Delighted to announce that we exceeded our crowdfunder target - thank you so much to everyone that supported us! We will be releasing the album in February 2018, with a tour in Europe and the UK. More details to follow - you can check back here, or sign up to my mailing list and I'll let you know as things progress. The rough tracks that we recorded at Castlesound Studios for our second Alan Benzie Trio album a while back are sounding great, and we are now looking for some help to finish the album (these things cost a lot of money!). Check out this video and our crowdfunder page where you can learn more and contribute (with some nice rewards). "...September days are here, with summer’s best of weather and autumn’s best of cheer"
The beautiful Steinway B I played for the second Alan Benzie Trio recording. Huge thanks to Neil Mclean for very generously lending it to us! "Hard to imagine Helen Hunt Jackson writing this if she lived in Scotland", I think to myself as I watch the rain run down the window, but that can't diminish my excitement that autumn is coming - that wonderful season of warmth and chill, the changing colours, optimism and wistfulness - I love it! It's been a fantastic Summer: some great festival gigs with Fat-Suit, lots of fun with Mezcla, Edinburgh Jazz Festival and as much tennis as I could get in around all that... That's not to mention the undoubted highlight of the year for me, recording our second Alan Benzie Trio album! Getting that all ready for release will be one of my main activities this Autumn, and we will be releasing it in February 2018. I'll be announcing tour dates for that too, so keep an eye out. Looking forward to more Mezcla and Fat-Suit good times too, and more immediately, Islay Jazz Festival. More details on the gigs page, hope to see some of you there - do come and say hello! Just a wee heads up about some gigs coming up in the Edinburgh Jazz Festival, with my Piano Playlist project, a Birth of the Cool recreation project, and up and coming young vocalist Luca Manning. More details on the gigs page! Also very excited to have Marton and Andrew here next week, rehearsing some new Alan Benzie Trio material and generally making some nice music. Here's a wee reminder that we have ONE GIG in Scotland for the next good while, and it is next Thursday the 25th of May, at 8.30pm - don't miss it! Had a fantastic gig last night with my Piano Playlist project. A big thank you to Stephen and Brodie on drums and bass, to everyone at the Jazz Bar, and to everyone who came and listened so intently and applauded so enthusiastically - it's not always you can hear a pin drop in there, and it was such a pleasure to play in that environment! Quite a few of you signed up to my mailing list, but if there's anyone who missed that and would like to be in touch, you can sign up using the subscribe button at the bottom of this page, or get in touch through the contact page. There are a couple of things I'm particularly looking forward to at the moment: Firstly, I'm recording some music in a couple of weeks, with a new band featuring Davie Dunsmuir on guitar, Gus Stirrat on bass, and Mark Scobbie on drums. We've all written some tunes and we've been having a lot of fun playing together - I'll post links to that when it's available. Secondly, I'm getting together with Marton and Andrew for some more Alan Benzie Trio rehearsing in May. We will also be playing ONE GIG only, at the Jazz Bar on the 25th of May, including some new music that we still haven't played live yet. Come on down and be the first to hear it, it's shaping up very nicely! Thanks so much to everyone who came along to the Blue Lamp for my gigs in the Aberdeen Jazz Festival, it was great fun playing to packed rooms and appreciative ears both nights! There are a couple of wee clips of each gig on my Facebook page. I also found myself doing something rather different recently, interpreting Japanese-English for a semiconductor company near Glasgow! I have enjoyed learning Japanese for quite a few years and it was a lot of fun putting that skill to the test in a different situation than I'm used to (chatting to friends, talking at gigs etc). I learned some new words too, although not really the kind you would use in everyday conversation to be honest! I have 3 gigs coming up at the Jazz Bar in Edinburgh - 2 "World Premier Quintet" sessions on Saturday the 25th of March and 1st of April, and another edition of my "Piano Playlist" gig on the Wednesday the 5th of April (all at 8.30pm). Piano Playlist features tunes by my favourite piano players, and this edition has Stephen Henderson on drums, and Brodie Jarvie on bass (back from Amsterdam for a few days). Please do come down if you are in Edinburgh! It's been a great first bit of the year - Fat-Suit's gig at Celtic Connections was the definite February highlight. Now I'm really looking forward to 2 gigs in the Aberdeen Jazz Festival that are happening very soon: solo piano on the 15th of March at 8pm, and with Fat-Suit on the 18th of March at 11pm (both at the Blue Lamp). Come along and say hi if you are around! A rather belated one, admittedly! I’m really looking forward to 2017 - there are some exciting things in the pipeline with the trio and with Fat-Suit, as well as a few other projects and bits and bobs. The trio in London in November last year - thanks to Aiga Ozolina for the new photos! I really enjoyed getting together with Andrew and Marton to rehearse new material and experiment in November, and looking forward to sharing some of that over the next while. I’ll be sharing mostly through my new Facebook page, which will have slightly more regular updates, including stuff we are doing with the trio, Fat-Suit and other things I’m getting up to. If you would like to keep up to date with that, please head on over and give the page a like. Really enjoyed being down in London for a few days to rehearse, practice and generally try out various ideas with the trio for 5 days. Seeing as the London Jazz Festival was on at the same time, it would have been crazy not to catch a few gigs while I was down - my personal highlight was Julian Lage Trio, just incredible! Not long after returning to Glasgow, I had the pleasure of being a judge for the semi-final of the Scottish Young Jazz Musician of the Year. I remember judging the final a few years ago, and being very impressed at the standard of playing and musicianship, and this was no different. I very much enjoyed listening to all the young musicians do their thing - a bit less pleasurable to try and pick only 5 to go through to the final mind you! I then had back-to-back gigs at the Jazz Bar, the first being an outing for my “Piano Playlist” project (playing the music of some of my favourite pianists) with Doug Hough and Euan Burton, and the second being reunited with my dear friend and amazing saxophonist/composer Leah Gough-Cooper for her quartet. Both were great fun and many thanks to everyone who came out to listen. A big thanks to everyone who has come to gigs, bought CDs and sent lovely messages this year, I can't wait to make more music for you in 2017. See you next year! Otherwise known as August in Japan - brutal! I got heatstroke the night I arrived, and took hydration and air conditioning much more seriously after that... On a brighter note, I had some lovely gigs and enjoyed catching up with my friends in Tokyo. The highlight was playing with Yumi Sugimoto's Jazz Orchestra in Kawagoe, Saitama. Kawagoe escaped much damage during World War II, and is often referred to as 小江戸 (Koedo or "Little Edo"), as it still has many buildings from the Edo period. The soundcheck at Yamabuki Kaikan, Kawagoe. Looking forward to touring with Fat Suit in the Czech Republic and Poland soon, and the album release is just around the corner. The official launch will be at St Luke's & The Winged Ox in Glasgow, on the 30th of October - come and join in the madness! Just wanted to say a BIG THANK YOU to everyone who came out to the Piano Playlist gig last night at the Jazz Bar for the Edinburgh Jazz and Blues Festival. It was fantastic to have the room packed full, and what an incredible vibe! We had an absolute blast playing for you all. Hope to see you again next time, and if you’d like to be in touch in the meantime, give me a shout through the Contact page. I’m off to Japan again right after that, and very much looking forward to it. I’ve never been at this time of year before, so here’s hoping my poor Scottish body can cope with the heat and humidity (our summer isn’t exactly scorching). I hear there are flying cockroaches at this time of year too, just for good measure! Hope to see some of you in Edinburgh, Tokyo or somewhere else - またね! The live session we did with the trio for The Jazz House is going to be re-broadcast on BBC Radio 3's "Jazz Line-Up" on Saturday the 16th of April! It's a great show and I'm delighted that they liked the music so much. Takuya and I hanging out before the gig. I had an absolute blast in Japan during the festive season, catching up with some of my friends from Berklee, eating far too much delicious food and making some great music! My first gig of the New Year was with Japanese trumpet player Takuya Kuroda, who's Blue Note album "Rising Son" I had been listening to quite a lot throughout 2015 - if you haven't heard it, do check it out. It was such fun to play some of that music with the man himself, and he sounded great on my tunes too. He also has a very funny sense of humour, I could barely eat dinner for laughing! While I was in Japan, I was honoured and delighted to hear that "Traveller's Tales" was featured alongside the likes of Kamasi Washington, GoGo Penguin and Liane Carroll as one of BBC Radio Scotland's "The Jazz House" albums of the year in their review of 2015! We had a great time doing a live session for them around the time of the release tour and we're really pleased they liked the album so much. After what seemed like a blink of an eye it was time to say goodbye and head back to Scotland. I'm now looking forward to another couple of gigs with Fat-Suit in Glasgow and Aberdeen, where we'll be playing some of the music from the new album, which I think is due to be released later this year. Glasgow is the 17th of March at Stereo, and Aberdeen is on the 19th of March at the Blue Lamp, as part of the Aberdeen Jazz Festival. Do come along and say hello if you are in the area! What the critics are saying about "Traveller's Tales"
Suddenly grabbed by the desperate urge to buy a copy or three? Head over to the Buy page for more info!